Cheryl Robbins is a Taiwan Tourism Bureau-licensed English-language tour guide specializing in indigenous area tourism. As she has worked to promote Taiwan to Western markets, she has come to understand the obstacles and opportunities related to the international marketing of Taiwan's tourism. In several countries, indigenous tourism is the driver of overall tourism, such as the US, Australia and New Zealand. There is no reason that Taiwan's indigenous area tourism cannot be the driver of specialty tourism in Taiwan, especially as many indigenous communities are located in areas of natural beauty, providing opportunities for both ecotourism and cultural tourism. 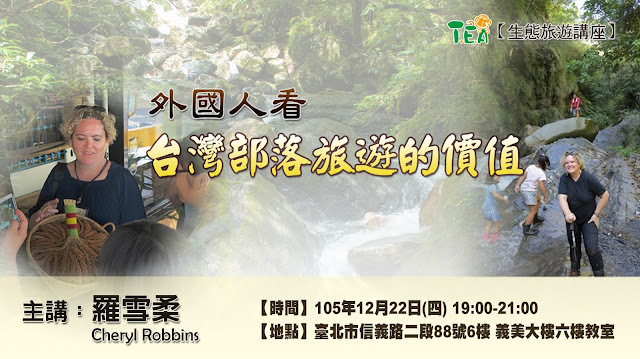 Some overseas examples will be looked at to understand what Taiwan can learn, including what to do and not to do, in developing its indigenous area and specialty tourism. Very recently, indigenous communities in Taiwan have been working to take control of their own tourism, developing itineraries and training residents to serve as guides. This talk provides an overview of these efforts, as well as what is needed to successfully promote these efforts internationally.